“If we don’t get a handle on this at both the federal and at the state level, and at county, school district and city level, these programs are growing so fast and so out of proportion with the rate of the private economy, that within 15 years it will consume a vast majority of the state’s budget,” Pawlenty said. Jim Carlson. owner of Carlson Financial Strategies in Burnsville, was one of those business people who said he was glad to hear the govenor talking of containing such costs. Carlson told the governor and others of one of the unintended consequences he’s seen when it comes to the high cost of health care — and the state’s generosity. One of his clients, who works in the construction industry, had been trying to earn less than $50,000 a year so that his 11 children could qualify for public assistance for health care, Carlson said. Pawlenty said he, too, has heard of people who try to adjust their income so they can qualify for subsidized health care. Governor Pawlenty today signed an Executive Order creating the Governor’s Clean Energy Technology Collaborative (CETC). This group of up to 15 members appointed by the Governor will be responsible for developing a Clean Energy Technology Roadmap that will provide the research and development vision, along with a plan and milestones, to ensure Minnesota achieves the state’s clean energy goals. Among those goals are the 25 x ’25 renewable energy standard that requires 25 percent of the state’s energy to come from renewable sources by 2025. CETC members will include scientists from industry and academia, with the Director of the Office of Energy Security and Commissioners of Agriculture, Employment and Economic Development and the Pollution Control Agency serving as ex officio members. A second Executive Order signed by Governor Pawlenty today creates the Minnesota Office of Energy Security within the Minnesota Department of Commerce. “Clean energy and energy security is a critical issue to Minnesota’s future. 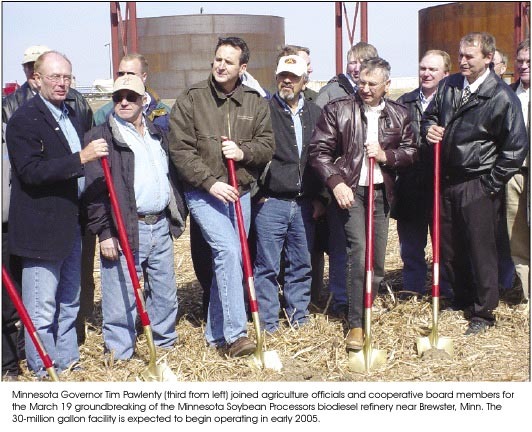 This organizational change will keep Minnesota moving towards a better energy future,” said Governor Pawlenty. The Governor appointed Commerce Department Deputy Commissioner Edward Garvey to also become the director of the new office. Garvey will coordinate energy and climate issues throughout the administration. Creating a focused office on energy security will allow the public easier access to energy information and technical assistance. The Office of Energy Security will be housed in and receive administrative support from the Department of Commerce and there is no fiscal impact from this change. Through increased energy efficiency, use of renewable energy and changing industrial processes over the next several years, Minnesotans will address the threat of climate change and take actions to reduce greenhouse gas emissions. These actions could result in marketable carbon credits that could be sold in developing regional, national or global carbon trading programs. To help plan for and foster this credit trading opportunity, Governor Pawlenty is proposing the creation of the Carbon Market Planning Authority (CMPA) within the newly created Office of Energy Security. Creation of CMPA will be submitted to the legislature in the 2008 session. CMPA will study and plan for the potential for a carbon market exchange and the need for financing strategies to encourage the creation and viability of a carbon credit market. CMPA will include six at-large members appointed by the Governor, as well as the Commissioners of the Pollution Control Agency, Employment and Economic Development, Finance, and Agriculture and would be chaired by the Director of the Office of Energy Security. “While it’s still too early to know exactly how the carbon credit market will develop, it’s not too early to prepare for the emergence of markets,” Governor Pawlenty said. Rock-Tenn heats up — FIRE! The two-alarm fire at Rock-Tenn Co. in St. Paul on Thursday caused $500,000 in damage, the St. Paul fire marshal said today. Fire investigators have narrowed the cause of the fire, but it remains under investigation, said Fire Marshal Steve Zaccard. It wasn’t intentionally set, he said. At the state’s largest paper recycler, work has continued elsewhere at the 42-acre site and will soon resume at the site of the fire, said Rock-Tenn general manager Dave Briere. No workers were injured in the fire at Rock-Tenn, near Interstate 94 and Vandalia Street. More than 40 firefighters fought the blaze. Throughout this garbage burner fight, Rock-Tenn is claiming to be a “victim” of MERP, the Metropolitan Emissions Reduction Project (plan? p??? ), which was the means of shutting down coal at Xcel’s Riverside and Highbridge plants. Anderson also authored a bill, S.F. 2854, providing for the recovery of stranded costs by thermal energy customers adversely affected by the Metropolitan Emissions Reduction Program. Representatives of the Rock-Tenn Company, which manufactures 100 percent recycled paper board and buys steam from the High Bridge plant in St. Paul, outlined their needs and the investments they have made in their business and a steam line between the High Bridge plant and their facility, which is located in the Midway area of St. Paul. About $20 million of costs will be stranded when the High Bridge plants converts from coal to natural gas, said Larry Schedin, an engineer. Rock-Tenn Vice President Jack Greenshields said the company intends to build a biomass power generation facility on its manufacturing site. Chris Clark, Xcel Energy, said the bill is the wrong way to solve Rock-Tenn’s problem. The company’s contract to buy steam is with NRG, not Xcel, Clark said. Xcel ratepayers should not bear the burden of paying for Rock-Tenn’s loss, he said. Beth Goodpaster, Izaak Walton League, said the bill sets an inappropriate precedent for the use of emissions reduction riders. 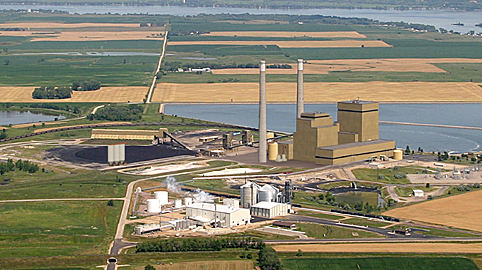 Stranded cost recovery usually involves a taking by the state, Ourada said, but the emissions reduction plan is a voluntary action undertaken by Xcel. Rock-Tenn made a business decision to buy steam from a third party, he said. However, Anderson said the state helped along the process leading to the conversion of the High Bridge plant. A motion to advance the bill failed on a 6-6 tie. Minnesota Statutes, section 216B.1692, subdivision 5. Such costs must also include amounts to be reimbursed to a thermal energy customer of a facility subject to this primary metropolitan emission reductions proposal for recovery of stranded costs under the rider caused by the qualified emission reductions project pursuant to Minnesota Statutes, section 216B.1692, subdivision 5. Such stranded costs include, but are not limited to, recovery of costs incurred in connection with the construction and other required capital improvements to the steam production facilities that are subject to a qualifying emissions reduction project which provides steam service to such thermal energy customer and to the steam delivery pipeline used to deliver steam from the steam production facilities to the thermal energy customer. The commission shall verify and approve the amount of stranded costs to be recovered under the rider. Thankfully this didn’t get anywhere. Whatever were they thinking? Note Larry Schedin weighing in on this. He was “The Environmental Organizations” expert witness in the SW MN 345kV line, a former Xcel employee, probably back in the NSP days. He’d worked on the 345kV ring around the metro area! Here’s his testimony for the Minnesota Chamber of Commerce in the Rate Case. He was also involved in the 2004 Wind Integration Study. Excelsior Energy Appeal tossed out! Here’s the latest – Excelsior Energy’s appeal of the PUC-nondecision on its Mesaba Project IGCC plant was tossed out, one more nail in the Excelsior coffin! “This appeal is dismissed as premature and not taken from a final agency action.” That’s one. AND, they were also tossed out on their request for discretionary review! TWO NAILS! How many nails does it take? We’ll see, because we’ll just keep hammering and hammering.